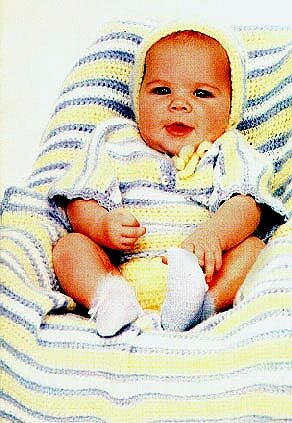 Your favorite baby will be ready to go visiting in this attractive 4-piece crocheted outfit. Sweater, soakers and bonnet with matching blanket will have friends and family cooing and it's oh so easy to make: the instructions are written in plain English, with no abbreviations. Let us know how you like them! Instructions are for infant's size. Changes needed for 6 months size and 1 year size are in parentheses. Blanket: Approximately 29 inches wide by 35 inches long. The entire blanket is worked in single crochet in stripes as follows: 4 rows of Color A, 2 rows of Color B, 2 rows of Color C, and 2 rows of Color B. Continue to work 4 rows of Color A, 2 rows of Color B, 2 rows of Color C, and 2 rows of Color B throughout, ending by working 4 rows of Color A. With the size G hook and Color A, chain 103. This row is on the right side of the work. Work 1 single crochet in the second chain from the hook and 1 single crochet in each remaining chain. You will now have 102 single crochets. Chain 1 and turn the work around, work 1 single crochet in each single crochet across. Continue to repeat Step 4 until 4 Color A stripes have been completed. With the right side of the blanket facing you, and the size G hook, attach Color B in the lower right hand corner. Repeat Step 2. You have single crocheted around entire blanket. To join, work 1 slip stitch in the first single crochet. Working over multiples of 4 single crochets, work 1 single crochet in the next single crochet, skip the next single crochet, work 1 single crochet, 1 double crochet, 1 single crochet all in the next single crochet, skp the next single crochet. Continue this pattern around entire blanket. Finish off by working 1 slip stitch in the first single crochet of this row. With size G hook and Color A, chain 9 (10, 11). This row is on the right side of the work. Work 1 single crochet in the second chain from the hook and 1 single crochet in each remaining chain. You will now have 8 (9, 10) single crochets. Repeat Step 3, 13 (14, 15) times. You will now have 36 (39, 42) single crochets. Chain 1 and turn the work around. Work 1 single crochet in each single across. Continue to repeat Step 5 until your piece measures 8 (8 1/2, 9) inches. With the right side of the back facing you, work 1 single crochet in each stitch along the opposite side of the starting chain. You will now have 8 (9, 10) single crochets. Repeat Step 3 of the back. You will now have 10 (11, 12) single crochets. Repeat Step 5 of the back. Continue to repeat Steps 3 and 5 of the back twice more. You will now have 14 (15, 16) single crochets. Repeat Step 3 of the back 5 (6, 7) times. You will now have 24 (27,30) single crochets. Chain 7 and turn the work around. Work 1 single crochet in the second chain from the hook and 1 single crochet in each of the next 5 chains, work 1 single crochet in each single crochet across. You will now have 30 (33, 36) single crochets. Repeat Step 6. You will now have 36 (39, 42) single crochets. Continue to repeat Step 5 of the back until your piece measures 8 (8 1/2, 9) inches. Fold 3 rows at the top edge to the inside to form the casing; sew loosely in place, leaving a 1-inch opening. Thread the elastic through the casing and adjust it to the desired length. Sew the ends together. Sew the opening in the casing closed. 1) With the right side of the work facing you, and size G hook, join Color B to a leg opening at a seam; chain 1 and work a multiple of 4 single crochets around the leg opening. Join with a slip stitch in the first single crochet. 2) Repeat Steps 9 and 10 of the sweater sleeve edging. 3) Repeat on the other leg opening. The entire bonnet is worked in single crochet in stripes as follows: 4 rows of Color A, 2 rows of Color B, 2 rows of Color C and 2 rows of Color B. Continue to work 4 rows of Color A, 2 rows of Color B, 2 rows of Color C and 2 rows of Color B throughout. With size G hook and Color A, chain 37 (41, 45). This row is on the right side of the work. Work 1 single crochet in the second chain from the hook and 1 single crochet in each remaining chain. You will now have 36 ( 40, 44) single crochets. Chain 1 and turn the work around. Work 1 single crochet in each single crochet. Continue to repeat Step 4 until you piece measures 4 1/4 (4 3/4, 5) inches. Do not change colors even if you have just completed a stripe. 7. Chain 1 and turn the work around. Work 1 slip stitch in each of the first 12 (13, 15) single crochets, work 1 slip stitch in the next single crochet, working with the new color if you are beginning a new stripe. Chain 1 and work 1 single crochet in the same single crochet and 1 single crochet in each of the next 11 (13, 13) single crochets. Do not work in the remaining single crochets. 8. Repeat Step 4 four times. 9. Chain 1 and turn the work around. Draw up a loop in each of the first 2 single crochets, wrap the yarn over the hook and draw it through all 3 loops on the hook, work 1 single crochet in each single crochet until there are 2 single crochets left, draw up a loop in each of the last 2 single crochets, wrap the yarn over the hook and draw it through all 3 loops on the hook. You will now have 10 (12, 12) single crochets. 10. Repeat Step 4 five times. 11. Repeat Step 9. You will now have 8 (10, 10) single crochets. 13. Continue to repeat Step 4 until the back measures 3 1/2 (4, 4 1/2) inches. Sew the side edges of the back to the edges of the front. With the wrong side of the work facing you, and size G hook, join Color B at the lower right front corner. Chain 1 and work a multiple of 4 plus 1 single crochets across the front edge. Repeat Steps 3 and 4 of the sweater neck edging. Fold the edging and the first Color A stripe to the right side to form a cuff. With the right side of the work facing, and size G hook, join Color A at the lower left front corner. Working through both thicknesses at the front edges, work a multiple of 4 plus 1 stitch along the neck edge. Chain 2 and turn the work around. Work 1 half double crochet in each of the first 2 single crochets, then chain 1, skip the next single crochet and work 1 half double crochet in the next single crochet. Continue to chain 1, skip 1 single crochet and work 1 half double crochet in the next single crochet until there is 1 single crochet left. Work 1 half double crochet in the last single crochet. Chain 1 and turn the work around. Work 1 single crochet in each of the first 2 half double crochets, then work 1 single crochet in the next chain 1 space and 1 single crochet in the next half double crochet. Continue to work 1 single crochet in the next chain-1 space and 1 single crochet in the next half double crochet across until there is 1 half double crochet left. Work 1 single crochet in the last half double crochet. Hold 2 strands of Color A together to form a double strand. With size G hook and double strand, make a chain 28 inches long. Weave the tie through the beading row. The entire sweater is worked in single crochet in stripes as follows: 4 rows of Color A, 2 rows of Color B, 2 rows of Color C and 2 rows of Color B. Continue to work 4 rows of Color A, 2 rows of Color B, 2 rows of Color C and 2 rows of Color B throughout, ending by working 4 rows of Color A. With size F hook and Color A, chain 39 (41, 43). This row is on the right side of the work. Work 1 single crochet in the second chain from the hook and 1 single crochet in each remaining chain. You will now have 38 (40, 42) single crochets. Chain 1 and turn the work around. Work 1 single crochet in each single crochet across. Repeat Step 4, 22 (24, 26) times. 6. Chain 15 (17, 19) and turn the work around. Work 1 single crochet in the second chain from the hook and 1 single crochet in each remaining chain, work 1 single crochet in each single crochet across. You will now have 52 (56, 60) single crochets. 7. Repeat Step 6. You will now have 66 (72, 78) single crochets. 8. Repeat Step 4, six times. 9. Chain 1 and turn the work around. Work 1 single crochet in each of the first 32 (35, 38) single crochets. Do not work in the remaining single crochets. 10. Working on 32 (35, 38) stitches only, repeat Step 4, 11 (13, 15) times. You should end at the sleeve edge. 11. Chain 1 and turn the work around. Work 1 single crochet in each of the first 27 (29, 31) single crochets. Do not work in the remaining single crochets. 12. Working in 27 (29, 31) stitches only, repeat Step 4, 6 (8, 8) times. You should end at the neck edge. 14. Skip 2 single crochets on the last long row before Step 9. 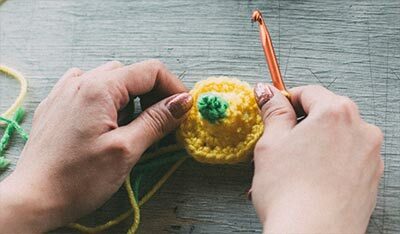 With the right side of the work facing you, join the yarn in the next stitch, chain 1 and work 1 single crochet in the same stitch and 1 single crochet in each remaining single crochet. 15. Repeat Step 4, 11 (13, 15) times. You should end at the neck edge. Do not change colors at the end of the last row even if you are at the end of a stripe. 16. Chain 1 and turn the work around. Work 1 slip stitch in each of the first 5 (6, 7) single crochets. Work 1 slip stitch in the next stitch, using the new color if you are beginning a new stripe. Chain 1 and work 1 single crochet in the same stitch and 1 single crochet in each remaining single crochet. You will now have 27 (29, 31) single crochets. 17. Repeat Step 4, 6 (8, 8) times. You should end at the sleeve edge. 18. Chain 1 and turn the work around. Work 1 single crochet in each single crochet of the left front, chain 12 (14, 16) for the neck edge, work 1 single crochet in each single crochet of the right front. 19. Chain 1 and turn the work around. Work 1 single crochet in each of the first 27 (29, 31) single crochets, work 1 single crochet in each of the 12 (14, 16) chains, and work 1 single crochet in each of the last 27 (29, 31) single crochets. 20. Repeat Step 4, 17 (19, 23) times. Do not change colors at the end of the last row even if you are at the end of a stripe. 21. Chain 1 and turn the work around, work 1 slip stitch in each of the first 14 (16, 18) single crochets, work 1 slip stitch in the next single crochet, working with the new color if you are beginning a new stripe. Chain 1 and work 1 single crochet in the same single crochet and 1 single crochet in each single crochet until there are 14 (16, 18) single crochets left unworked. Do not work in the remaining stitches. 22. Repeat Step 4, 24 (26, 28) times. Sew side and sleeve seams. With the right side of the work facing you, and the size F hook, join Color B at the lower left edge of the back opening. Work single crochets evenly along the edge of the opening to the top. Mark the position of 3 buttons evenly spaced along the edge of the lowest one 2 stitches above the lower edge and the top one, 2 stitches below the top edge. With the wrong side of the work facing you, join Color B at the lower right edge of the opening. Work the same number of single crochets along this edge as on the other side. Chain 1 and turn the work around. Work 1 single crochet in the first single crochet, chain 2 and skip 2 single crochets, work 1 single crochet in each single crochet to the stitch opposite the next marker, chain 2 and skip 2 single crochets, work 1 single crochet in each single crochet to the stitch opposite the last marker, chain 2 and skip 2 single crochets and work 1 single crochet in each single crochet to the end. With the right side of the work facing you, and the size F hook, join Color B at the left back corner. Work a multiple of 4 plus 1 single crochets evenly across the neck edge. Join Color B in the first single crochet of the last row, chain 1 and work 1 single crochet in the same single crochet. 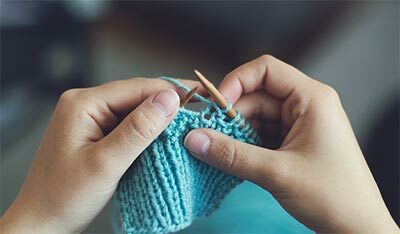 Skip the next single crochet, work 1 single crochet, 1 double crochet and 1 single crochet all in the next single crochet, skip the next single crochet, and work 1 single crochet in the next single crochet. Continue to skip the next single crochet, work 1 single crochet, 1 double crochet and 1 single crochet all in the next single crochet, skip 1 single crochet and work 1 single crochet in the next single crochet across. 5. With the right side of the work facing you, and size F hook, join Color B in the lower right front corner. Chain 1 and work a multiple of 4 plus 1 single crochets along the lower edge. 7. Repeat Steps 3 and 4. 8. With the right side of the work facing you, and size F hook, join color B at the sleeve seam. Chain 1 and work a multiple of 4 single crochets around the edge, join with a slip stitch in the first single crochet. 9. Chain 1 and work 1 single crochet in the same single crochet, skip the next single crochet, skip the next single crochet, work 1 single crochet, 1 double crochet and 1 single crochet all in the next single crochet, skip the next single crochet. Continue to work 1 single crochet in the next single crochet, skip 1 single crochet, work 1 single crochet, 1 double crochet and 1 single crochet all in the next single crochet, skip the next single crochet around. Join with a slip stitch in the first single crochet.